If you reside in the United States, you may place a secure online order at AB’s Webstore. For security purposes, you must first register for a username and password to confirm that you or your child is a registered AB recipient. Upon receiving a username and password, products may be charged to your American Express, Discover, MasterCard, or Visa card. Note: Web orders will not be billed through insurance. Yes. Please contact Customer Service. A customer service representative will take your order and place it on hold. On the business day we receive your check or money order for the order total plus shipping, your order will ship via FedEx. Yes. When you purchase five or more of the same product, you will receive a 15% discount. Please contact Customer Service. A customer service representative will determine which piece of equipment is malfunctioning. If the product in question is under warranty, the customer service representative will process a Return Materials Authorization (RMA). Call AB Customer Service for a return authorization number. When you receive the replacement product, you will also receive a postage-paid envelope. Please place the malfunctioning product in the postage-paid envelope and mail. Please contact Customer Service. A customer service representative will look up your name in our database and let you know whether your equipment is under warranty. 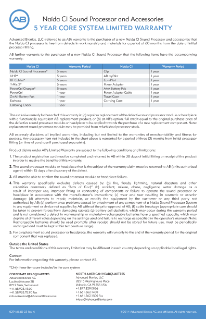 You may also review our standard warranty for products. See Warranty & Exchange Policy for details. If you don’t see the warranty listed for the AB product in question, please contact customer service. Please contact Customer Service. A customer service representative will verify if the product is no longer under warranty and discuss your options. You should receive your replacement product within 2 business days via FedEx. Please contact Advanced Bionics if you need your out-of-warranty sound processor replaced. We charge a repair fee to your debit or credit card and ship the replacement processor to you or your audiologist. I recently moved. How do I update AB with my new contact information? AB’s hours of operation are Monday through Friday, 5:00 a.m. to 5:00 p.m., Pacific Standard Time. Please contact AB Customer Service to discuss your options. Yes, air travel is safe for cochlear implant recipients. Please see related downloads in the right-hand column of this page. No. The Federal Aviation Authority (FAA) has confirmed that Advanced Bionics cochlear implant recipients are EXEMPT from powering off their sound processors when instructions are given to turn off cell phones, music players, or any electrical/digital device with an on/off switch. The FAA includes cochlear implants in the Hearing Aid category, exempting them from the requirement to be switched off. Please see related downloads in the right-hand column of this page. No. Metal detectors and security scanners should not damage the implant or sound processor. However, cochlear implant recipients passing through security metal detectors and scanners may activate the alarm. It is advised that patients carry their “Patient Emergency Identification Card” with them at all times. Cochlear implant recipients also might hear a distorted sound caused by the magnetic field around the security scanner door or hand-held scanning wand. Turning the sound processor volume down before passing through security screening will ensure that those sounds, if they occur, are not too loud or uncomfortable. Cochlear implant recipients may request a full-body pat-down with visual and physical inspection of the sound processor in place of the standard metal detector or scanner with x-ray procedure. Please see related downloads in the right-hand column of this page. They should be recycled as appropriate in your region. Why are batteries shipped ground? All couriers require the Lithium batteries to be shipped ground only. What services does AB’s Reimbursement Services offer? How do I contact AB’s Reimbursement Services? AB’s Reimbursement Services may be reached by telephone, fax, email, or regular mail. Their hours of operation are Monday through Friday, from 5:00 a.m. to 5:00 p.m. Pacific Time. How do I contact the BEA? To request an information packet or to join the BEA in order to receive eNewsletters and other important communications, complete our simple online form. What is AB's Refund and exchange policy? If the accessory product is unused, unopened, and within 90 days of the date of purchase, AB will exchange the accessory product for the same product or a similar product at the same price. Advanced Bionics does not charge a restocking fee for exchanges or returns of CI accessories. AB will refund an accessory purchase (not including shipping costs) if the product is unused, unopened, and within 90 days of the date of purchase. Standard accessory products from an initial kit or upgrade kit are not exchangeable and cannot be returned to Advanced Bionics for a refund. Phonak products purchased through AB, or through your local CI clinic for your AB system comes with 12-month standard warranty for all serialized items or 90-day standard warranty for all non-serialized items. Also, see the warranty card you received with your Phonak product. Contact your local CI Clinic for other extended warranty options. Where can I find more information on how to’s with my AB device, like how to change a tmic/earhook? Please refer to the MyNaída app. What is AB's Service contract? Please refer to the Service Contract. *These devices are no longer sold in North America or the EU.